How to analyze economic growth? A path of long-term growth can include, on the one hand, periods of growth collapse (which are usually brief, but still impact negatively the average growth rate in the long run), and on the other hand, generally longer periods of fairly stable economic dynamics. Collapses are related to occurrence of various shocks. Some of them are external, but many are caused by national economic policy. It afects both the vulnerability of the economy to external shocks and its ability to cope with them. Besides personality traits of the politicians, quality of the policy is decided in turn by the restrictions imposed on their powers, restrictions which are called stabilizing institutions. Outside the periods of collapses, factors responsible for the economic dynamics are forces which operate over an extended time or even continuously, called systematic forces of growth. They operate through changes in employment, accumulation of investment into capital, and changes in labor and capital productivity (that is changes in production achieved without changes in employment and without investment in new production capacity), and depend primarily on the institutions called the propelling institutions, and on economic policies shaped under their influence. Key propelling institutions, in view of vast literature on economic growth, include: private sector participation in ownership of companies; the structure of property rights, in particular the degree of freedom of private enterprise; the level of property rights protection, including the amount and stability of taxes; intensity of competition between suppliers; state fiscal position, determined mainly by the relation between social spending and GDP. They are reinforced by free-market reforms understood as those changes in business and state structures which are conducive to the growth of legitimate free market. They include decisive improvements in creation and enforcement of law, restricting uncertainty, which harms investments, especially those that are carriers of innovation. Anti-reforms, that is the opposite of free-market reforms, weaken the propelling institutions. Often, causing a build-up of imbalances in the economy, they lead to economic collapses. These institutions can create institutional barriers to growth, that is they can take forms that prevent the country from catching up with the wealthiest. Removal of such barriers not only strengthens the systematic forces of growth, but can also trigger specific growth mechanisms which make the rate of growth temporarily extremely fast (more on this topic in Balcerowicz and Rzońca, 2014). So far, how did Polish economy grow? Poland has achieved great success in the last 25 years. For more than two decades the country was developing at a pace exceeding an average of 4% a year, faster than other countries of Central Europe. Per capita income, adjusted for differences in price levels, increased from 29% of income per capita in Germany in 1992 to 55% this year. The disparity between adjusted per capita income of Poland and of Spain, another country in the West, is smaller than the distance between our country and Mexico or Hungary in the early nineties. Poland is wealthier than both these countries. According to IMF forecasts, in three years our income per capita will exceed per capita income in Portugal. In the Polish capital, Warsaw, it is higher not only than in Budapest, Prague, and Bratislava, but also than in Berlin and Vienna. Poland was not only a regional economic tiger. Total growth of our economy in 1991 did not differ much from the growth in South Korea and was faster than in Chile or Malaysia. While China was taking away share of international trade even from Germany, Poland increased it threefold, making up for the entire period of decline that lasted from the mid-seventies to the collapse of socialism. Polish exports during transformation grew significantly faster than even exports of South Korea. As a result, our position on international markets has become about one-third stronger than implied by Polish participation in the global GDP. Also the structure of Polish exports changed fundamentally. Yet in the mid-nineties the percentage of exports that were moderately or highly technologically advanced was 35%, and now it is almost 60%. Both dynamic growth in exports and improvement of its structure would not be possible without the inflow of direct foreign investment. Enterprises with participation of foreign capital accounts for almost half of Polish exports. As the base year (t=0) has been taken the particular country when it was on the development level of Poland in 1990 (actual years given in parentheses). t+1, t+2, t+3 etc. 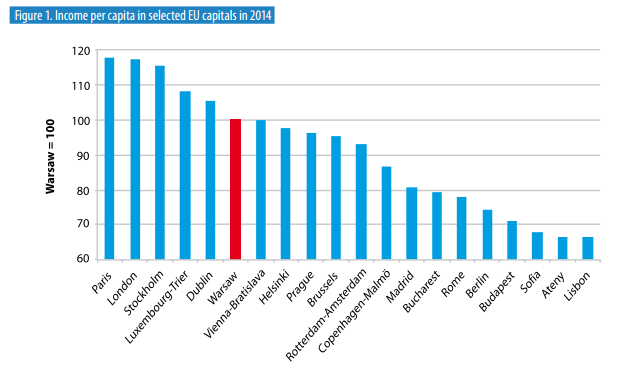 stipulates GDP per capita level in subsequent years in relation to base year. The fgure is based on GDP per capita data adjusted for price levels. Source: Own elaboration based on Conference Board data Intensive development of the export sector allowed Poland to avoid de-industrialization. The industry share of employment is in our case more than half higher than in the old EU countries, as well as slightly higher than the average in the countries of Central Europe. Meanwhile, at the beginning of transformation Poland stood out in the region due to high proportion of people employed in agriculture. 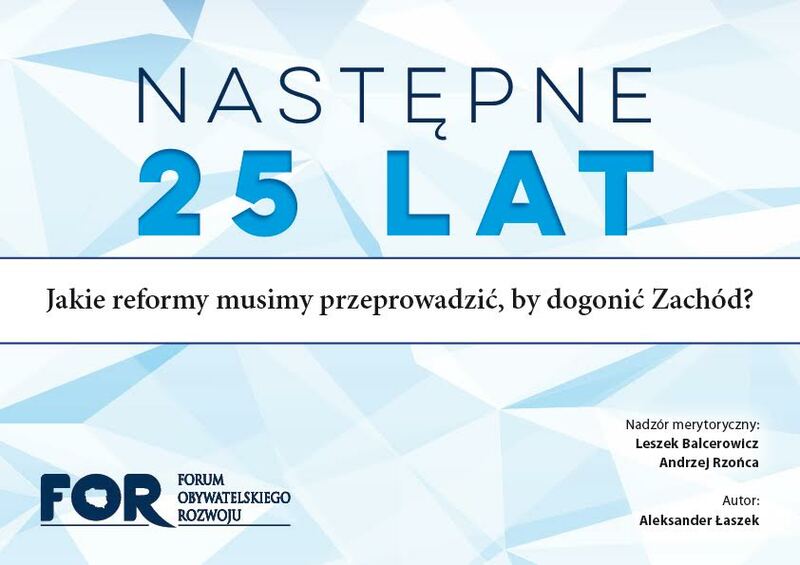 5 THE NEXT 25 YEARS What reforms we need to implement to catch up with the West? Figure 3. Volatility of the rate of economic growth in 2000-2015 Volatility is measured by the variance of GDP growth Source: Own elaboration based on IMF data Polish economic growth was not only fast, but also very stable. In the years 2000- 2015 its rate was less variable only in Belgium and France of all EU countries. None of cyclical slowdowns in our country was accompanied by decline in GDP. 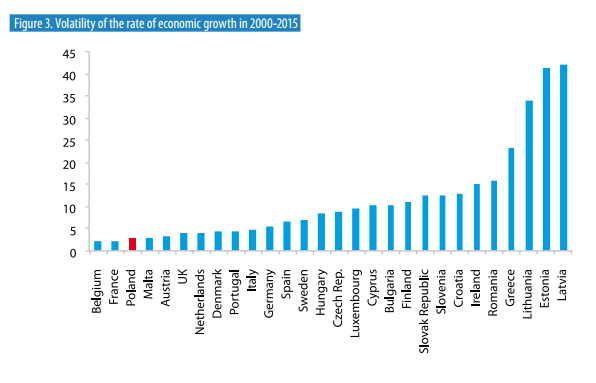 Poland was the only economy in the EU which has not shrunk even during the global fnancial crisis. Tis success is owed to a large degree to weaker growth of credit and of current account defcit than in most EU countries and in the region. These imbalances did not reach such a large size as elsewhere because tightening of monetary and fiscal policy broke the boom associated with the accession to the European Union. In addition, the banking regulator restricted the possibility of borrowing in foreign currencies by households, despite strong political pressure to the contrary. Stabilizing institutions passed the test: the independent central bank, limits of public debt, as well as foating exchange rate (which, unlike in most countries, was introduced without pressure for devaluation). It should be noted that if conservative monetary and supervisory policy, together with limits on government debt, did not slow the credit boom, the foating exchange rate would strengthen the shock caused by the global crisis. Te negative implications of the increase of zloty value of foreign debt (due to the depreciation of zloty) would likely outweigh the positive effects of improving the price competitiveness of domestic goods in relation to imports. Polish success in transformation had not only the economic dimension. For example, infant mortality dropped more than fourfold at that time. Te expected average life expectancy at birth increased by almost seven years. Generally, social indicators place Poland even higher in the international rankings than economic ones.